I think I may have mentioned in a previous post that from June 26th I am managing "Old Chilli B&B" in Daylesford for 12 months. The owners - Tim & Brian - are friends of mine and they are going travelling and working in Canada for the 12 months. This weekend is my first trial weekend totally on my own and I am pretty excited and a bit nervous. The B&B only has two rooms and they are both booked for this weekend and I am all prepared for breakfast tomorrow morning. Daylesford is situated in a really beautiful area and is only 90mins from home so it will be easy for me to shoot off home to catch up with the family. I'm looking forward to sharing the history and beauty of this part of Australia with you all out there. 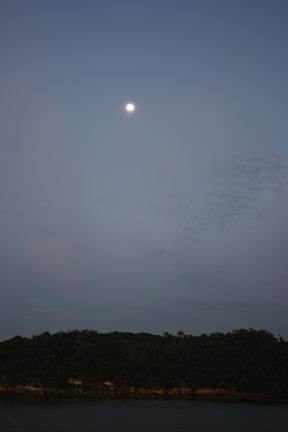 But until then I would like to share the full moon we encountered on our cruise. All the best to you on your new adventure Davine, you'll do magnificent! Nice photo, so serene looking. Have a fantastic weekend!